My story about Bill Richardson's seven-minutes-and-change at Tuesday's MSNBC debate in Philadelphia can be found HERE. 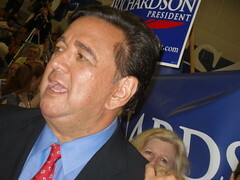 The highlight was when after criticizing Obama and Edwards for attacking Hillary, Richardson said, "I trust Senator Clinton, but I don't agree with a majority of her policies." The Factcheck.org piece I reference in the story == about Richardson's repeated claim that the U.S. ranks 29th in math and science -- can be found HERE. Unfortunately Richardson didn't get to talk about the sinister Roswell cover-up during the debate itself, even when Dennis Kucinich confirmed his UFO sighting. However, he did speak about it during the post-debate yack on MSNBC.